About five years ago, I became certified as a birth doula. It's a challenging, rewarding, difficult, and amazing gift to be able to do it. I wasn't sure when I first started the training where it would lead but I felt like God was leading me there so I stepped out and started. I've learned and changed so much since starting. Since then, I've been asked lots of times how I make the whole birth doula work when I'm a homeschooling mom of five little people, some just curious and some wondering if they could do it themselves. There is a huge need for all types of legit doulas (birth, postpartum, and bereavement), especially women of faith. I truly believe that building a culture of life includes real tangible support for mothers during pregnancy, birth, postpartum, and through loss. I'd encourage any woman who's feeling a little nudge to pray and see if it would work for her and her family, even on a limited basis. If it truly is God's will, He'll work out the details. So, how do I do that as a homeschooling, stay at home mom to 5 littles? Obviously, there is absolutely no way I could do any of it without the complete support and help of the husband. He's behind it all 100%. He's in charge at his office and usually has the ability to leave or not go into work if I have to go to a birth. Most women go into labor during the night and that's actually really helpful in my case because I can slip out during the night and he is already here. There's only been a couple instances where someone else had to help me out. He holds down the fort (and does a darn good job of it) while I am gone, taking over any chores, lessons, meals, etc. The boys love it. I schedule most of my meetings on weekday evenings after dinner, once in a while on a weekend. It means weeknights can be busy and there are many nights I'm heading out the door when I'd rather be putting on my pajamas but it's also really good for me to get out, too. Meetings are typically only 1-2 hours so I'm usually not home too late and I usually only one and almost never more than two a week. I am part part part time. I *try* to take about one client a month. Due dates are obviously all over the place, so sometimes there's some a little closer or a few months without. Once in a great while I'll make an exception for someone close to me or a repeat client but on the whole, I can't handle more than about that with my other obligations. Being on call 24/7 is pretty intense as are the effects of pulling an all nighter. Some births are really hard - physically and emotionally. So right now, that's my limit. I do like that this means I can usually focus all of my attention on each mom as her birth approaches. I don't advertise much. Not needing this as a full time job, I have the luxury of not needing to advertise and I can take clients as they come. I'm listed in a few directories, I think, but not much else beyond that. I figure this whole doula thing started as a calling on my heart from God and if it continues to be under His will He'll make the connections that are supposed to be made. So far, He has...mostly through word of mouth, referrals from other doulas, and now, repeat clients (SO fun to have repeat clients!). After I've had my own babies, I haven't taken clients until I'm comfortable baby and I are ready. Again, this is only possible because we're not completely depending on the income. My first calling is to my own babies so I need to feel certain we're both ready for me to be gone for a few hours or more. For Luke, I attended my next birth when he was about 9 months and with Ben it was about 7 months. They both had pretty laid back temperaments (as babies, at least) and I was confident they wouldn't be upset that I was gone. I decided to wait to make the decision of committing to another client until after they were born and I knew they would do okay. When my babies have been younger, clients are aware that in the case of a longer birth I may have to take a quick break and leave to nurse. I completed the big several day training at a time when my third had nearly finished nursing and completed all the follow up requirements while I was pregnant with my next. That worked out really well, especially since it was nearby and I didn't have to travel. I believe there may be several trainings available through organizations right now that are even done online. The program I worked through doesn't require recertification, though I definitely try to keep up with continuing education on my own through workshops, seminars, and personal study. 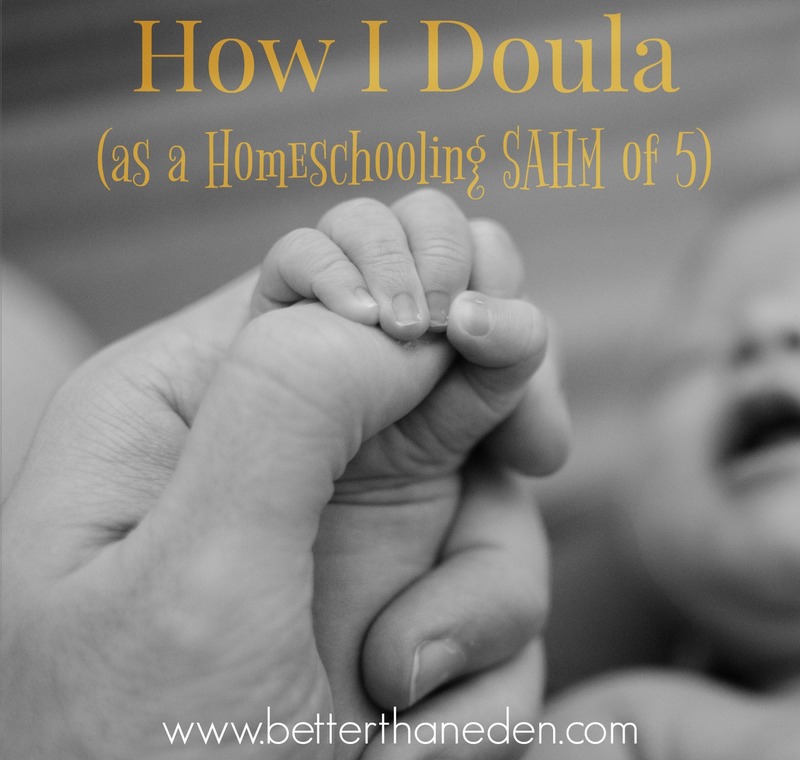 Homeschooling in many ways actually makes the doula gig a bit easier than if we were beholden to an outside schedule. I don't have to get anyone anywhere the next morning! We can take a day off if I was gone all night and can't manage lessons the next morning. I can schedule vacations and breaks around due dates and not worry about also having to factor in an outside school schedule. We're also at a point now where my oldest can watch the younger ones on his own for brief periods of time if I need to leave suddenly which couldn't happen if he wasn't here. In fact, now that I think about it, almost all the doulas I know are also homeschoolers which is interesting. So, that's how it happens. It's not always easy by any means but it is such a blessing to be able to serve other women and families in this way, as many or few as God allows. I also love what it teaches my boys about the dignity of women, babies, and birth. They're always put on prayer duty when I leave for a birth and love to hear the name of the new baby :) I hope that their memories of me serving this way will give them a unique and important perspective on how to better serve in their own vocations, be it wives and babies or as priests serving families. I'm sure I missed something so I'm happy to answer any questions if you have them! Such a fascinating post! I often wonder how it's possible to combine work and home-responsibilities and having posts like these help so much. Soo interesting. The part of your post that particularly touched my heart though was, " I also love what it teaches my boys about the dignity of women, babies, and birth. They're always put on prayer duty when I leave for a birth and love to hear the name of the new baby :) "
Hi Mary, I'm looking to get my doula training and am wondering if there's a program you recommend? Thanks! I came here with the same question — thank you for the very helpful, thorough post and your answer to this comment. Really glad I read it, not only for program recommendations but also that warning about abortion doulaing training!